Recently it seems that there has been a lot of media attention on small groups of Australians who do not want action on Climate Change, like the recent rally outside of Parliament in Canberra, which was organised by radio shock jocks and attended by "fringe" and "extremists" groups, as labelled my some in the media. However, if you want Action on Climate Change, and feel like that you're voice is not being heard in the community or noted by the media, come down to Belmore Park in Sydney this Saturday to show your support for action against Climate Change. 350.org Australia, Australian Conservation Fund, GetUp!, Greenpeace Australia, AYCC, 1 Million Women and the Nature Conservation Council of NSW are organising a peaceful, family friendly rally to show our politicians that yes, we support action on Climate Change and want a sustainable future for generations to come, and for ourselves. The organisers of the rally are not interested in fear mongering, displaying offensive or insulting banners, or using violent language. Instead, supporters will hear from a few good speakers, and celebrate the unified call for a green future. Plus there will be face painting for the kids. 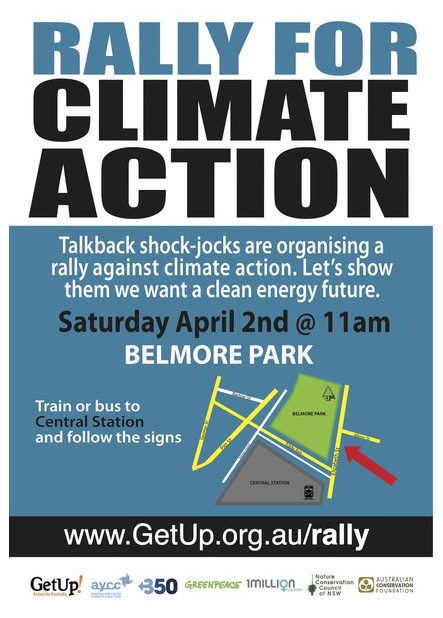 The rally begins from 11am at Belmore Park (near Central Station), this Saturday 2nd, April. You can learn more about the rally or rsvp by following any of the above links or the listed organisations. 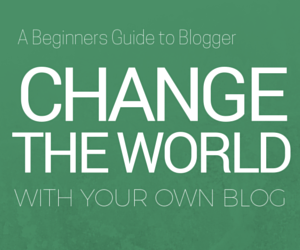 And don't forget to tell your friends and your friend's friends!